There is no recipe to making the perfect postcard, but there are some common best practices that can increase your chances of making a great one. Let's break-down the elements of an effective postcard, one that will get your customers to respond. 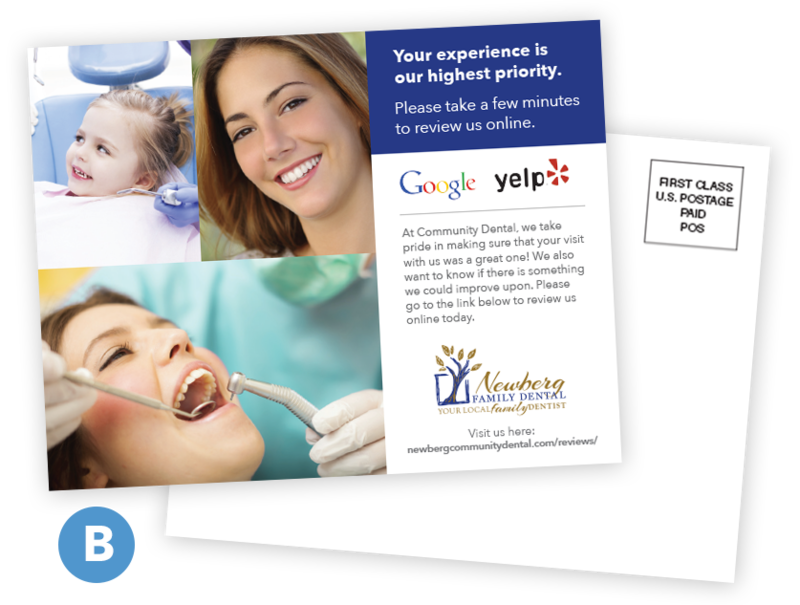 There are 5 must-haves, each has best practices that can be applied to enhance the overall power of your postcard. The sample postcard below highlights the five elements that you absolutely need to have on your mailer. Your postcard mail can vary from this layout, what's most important is that you have them all included. Once you define what you are offering your potential customer you can start thinking about how the postcard can support the offer. Good offers will motivate people to call or come into your business. Here's what the best marketers think about when crafting offers. The number one tip is to remember that all your marketing should make it clear out how your product benefits the customer - not a list of the features your product has. This is the number one mistake we see. People avoid pain and failure. Talk about how your product relieves the pain or can prevent failure. People are motivated by the desire to gain pleasure. Think about how your product leads to a positive outcome - you're offering prosperity, relief, and freedom. Mention what a user will lose, not just what they will gain. According to the theory of loss aversion, we are more likely to anticipate the pain of losing something than we are to feel the pleasure from gaining something of equal value. In other words, it feels good to get $50, but the pain that we feel from losing $50 is twice as intense as the pleasure we received from gaining the same sum. The headline is a benefits-driven statement the customer knows exactly what they'll get by responding. It should match the offer you defined above - is the offer a discount on your products then let them know what they'll receive. It can be short because you can use the supporting headline to provide more clarification. Often, the headline is short and specific like the following examples below. 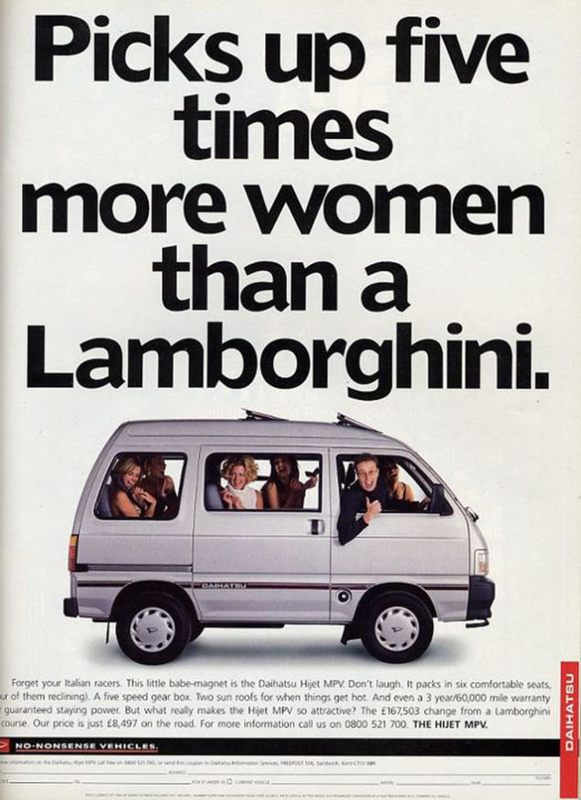 Legendary ad man, David Ogilvy once said his headline for a Rolls-Royce direct mail campaign was "the best headline I ever wrote." 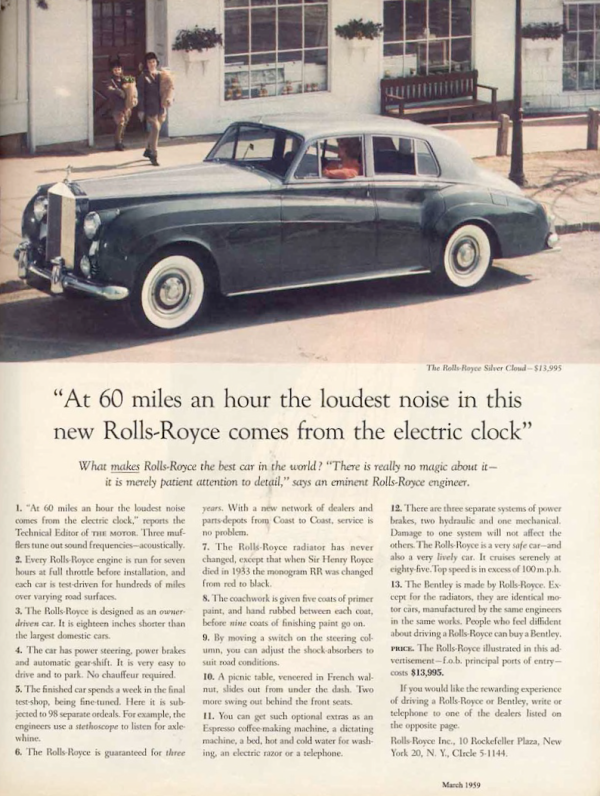 Analyzing the headline, "At 60 miles an hour the loudest noise in the New Rolls-Royce comes from the electric clock", reminds the customer of a positive outcome from owning the car. Read more over at Referral Candy's blog. 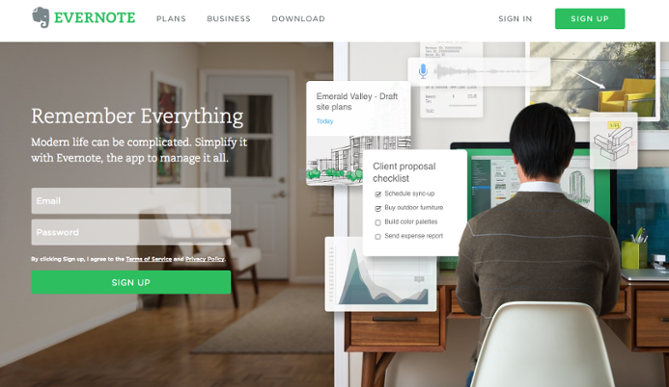 Here's an example from Evernote where they really nailed a clear benefit with this headline, "Remember Everything". Who hasn't forgotten something important or useful and providing a way to relieve that pain is compelling. Sherice Jacob on the KISS Metrics blog shares a headline from the Montage website that makes the reader think of how the product benefits the customer and the desire to gain pleasure. An example of both a headline and supporting headline used together for a new website called Oscar also found in Sherice Jacob's blog post. It is a health insurance company that is using technology to simplify insurance by making it friendlier and more accessible. Tapping on the recipient's desire to avoid pain and failure and leads to a positive outcome (gain pleasure). Look for images that match your offer and reinforce the benefits or pain. For example, if you're offer is only for a limited time, you may use an image that creates urgency (maybe a drained cell battery image). Showing rather than telling how it will be used by a customer. The hope is to get your customers to put themselves into a scenario where they are using your product. The best images will work with your headline and supporting headline to really sell your offer. 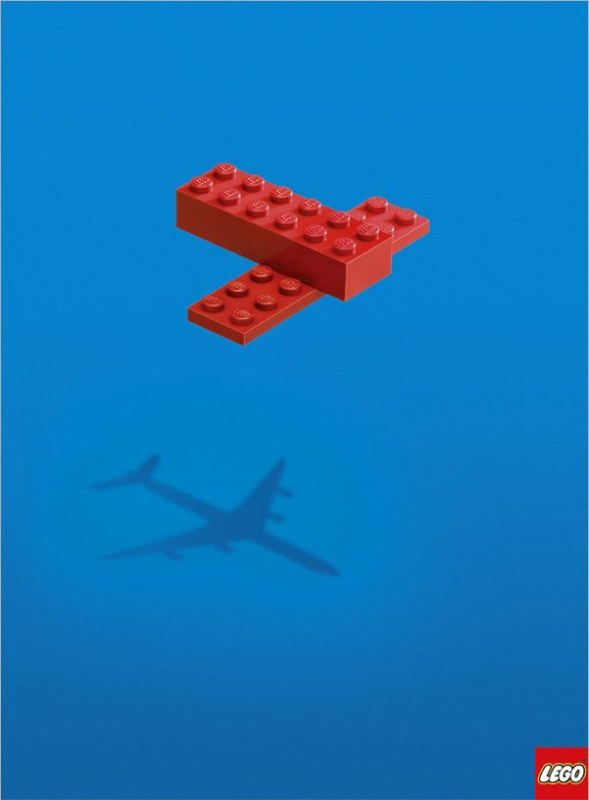 Mary Stribley's blog post 30 Advertisement Design Tips That Turn Heads: Brilliant Case Studies includes a powerful image that Lego used capture a benefit of the product. In another example she includes an example of making grand statements as a great way to get a lot of attention. The messaging on your postcard If they respond explains why they need your product and the call to action, also called the CTA, is how they get it. It may be to visit your business, call for a free consultation, go to your website to view properties or sign up to an email list, enter a contest, any number of things. Keep in mind that some people may go to your website or call you on their own after seeing your postcard, but giving a single focused action telling them how they should proceed works best. Be sure use action verbs like today, hurry, act now, visit us today, etc. TargetMarketing Magazine summed it up nicely... In printed direct marketing vehicles, the stalwart "order now" or "go online" prompts simply don't cut it anymore. You need to do more. How? By creating a compelling call to action that cannot be ignored. Prompt customers to act, to see the call to action screaming at them from the printed piece in a way that moves them to react and act. To do something! Customers are savvy. If the call to action isn't bold and relevant, customers will read right through it without doing anything. 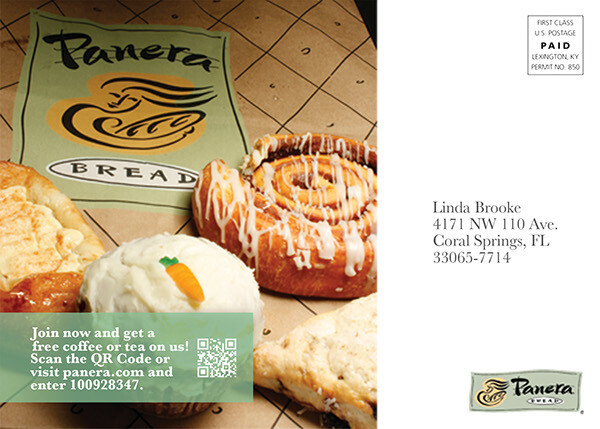 Panera asks mail recipients to "Join now and get a free coffee" and the website address. In these examples from Kohls, the first one has the action word "Hurry!" to create urgency and get the recipient to come into the store. 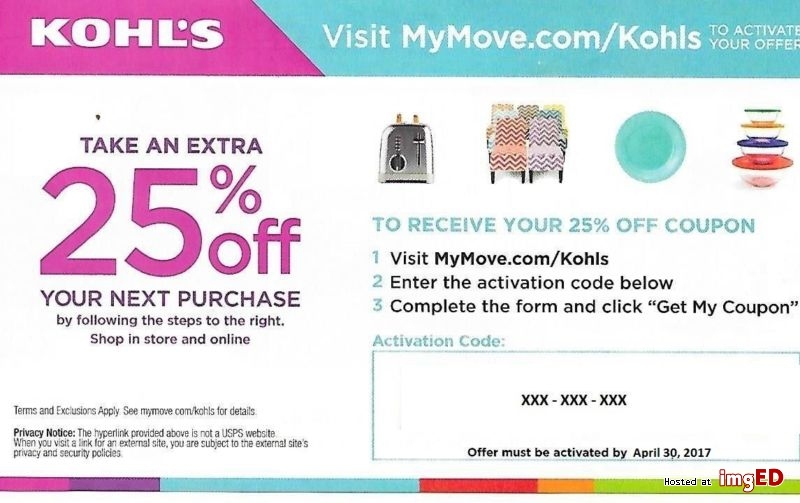 This postcard offers a discount and clear direction for what to do, "Visitâ€¦ to activate your offer". They repeat the single call to action in a few places too. Youâ€™ll also notice they also introduced some urgency in the bottom right box "Offer must be activated by [date]". 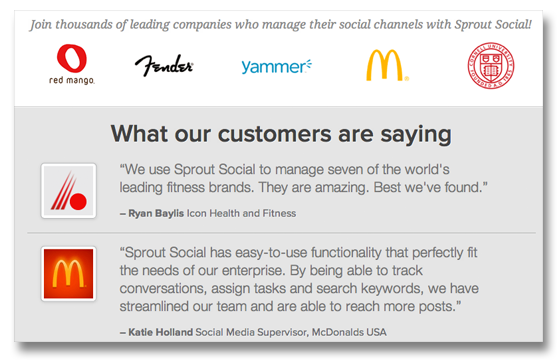 Social proof is the marketing tactic for easing the minds of worried or cautious customers. Using customer testimonials and reviews to let prospects know that other customers are saying about you. 95% of consumers use reviews and 86% say they are essential when making purchase decisions. And nearly one-third of consumers under the age of 45 consults reviews for every single purchase according to a Power Reviews blog post Survey Confirms the Value of Reviews, Provides New Insights. Providing a Yelp logo inviting prospects to look them up on Yelp to see what customers are saying. Just by inviting people to go to Yelp is proof enough for many prospects who won't feel the need to see for themselves. Now you should have a good understanding of what a direct mail postcard needs to be effective. Use these 5 elements of a direct mail postcard to quickly construct an effective postcard for your marketing campaigns.